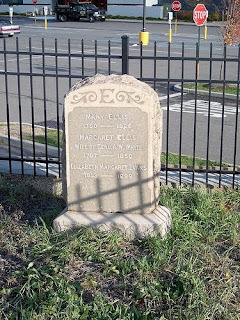 In the middle of a movie theater parking lot in New Brunswick, NJ sits the lonely grave of Mary Ellis (shown above). Mary's family buried her in a wooded grove not far from their farm. Over the years, the land was bought and sold many times. 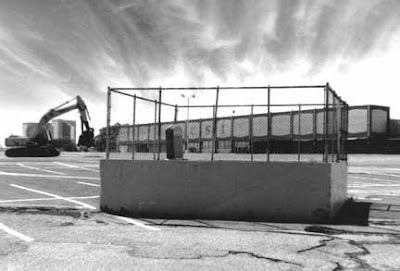 Eventually, her grave was surrounded by mini-malls and shopping centers. Today, it sits on a raised patch of earth in the middle of a parking lot. Surprisingly, Mary's isn't the only parking lot grave around. Roadsideresort.com has a terrific list of cemeteries overtaken by modern times. Check it out here. That's so wrong. The dead should be left alone, not just built around. I wouldn't be surprised if the person who decided to over-develope that area was huanted by the ghost of the person they practically built a mini-mall over. Seriously, people need to learn when to say when. I agree with Lady Dahlia, the dead should be left alone. It's wrong to dig up, or build over a grave site. Lucky they didn't break the grave down. How scary, seeing a grave in the middle of nowhere. There's something called a cemetery. It's wrong to have a grave in the wrong place. All in all, a great piece of history. I agree with Undiscovered Universe. At least they left the graves alone. THAT IS WRONG! !But what shopping mall? I live vey close to New brunswik in little town Called German Valley. not the real name!